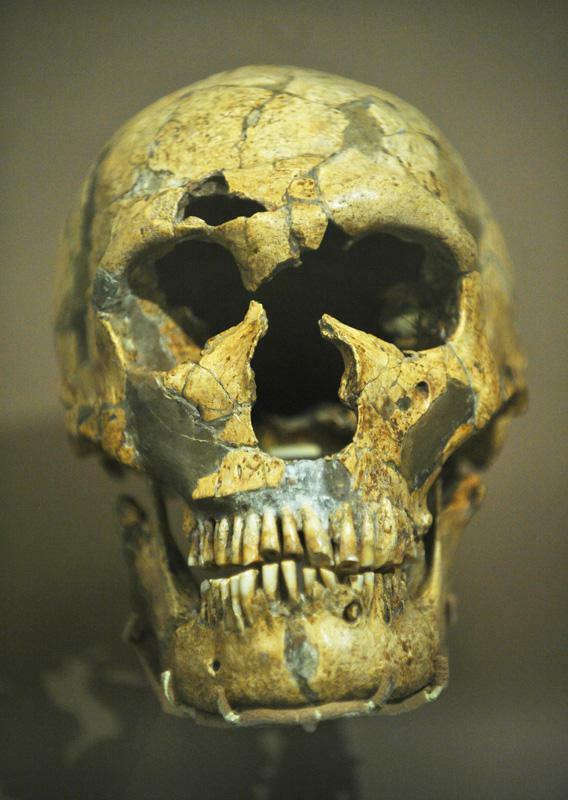 Who Would Win in a Fight: a Modern Human or a Neanderthal? We beat them at evolution. But what about fisticuffs? A team of archaeologists, paleoanthropologists, and paleoartists has created a more accurate Neanderthal reconstruction, based on a nearly complete skeleton discovered in France more than 100 years ago. The La Ferrassie Neanderthal man was short but stocky. If a modern man came nose-to-nose with a Neanderthal, could he take him in a fight? Possibly. A Neanderthal would have a clear power advantage over his Homo sapiens opponent. Many of the Neanderthals archaeologists have recovered had Popeye forearms, possibly the result of a life spent stabbing wooly mammoths and straight-tusked elephants to death and dismantling their carcasses. Neanderthals also developed strong trapezius, deltoid, and tricep muscles by dragging 50 pounds of meat 30 miles home to their families. A Neanderthal had a wider pelvis and lower center of gravity than Homo sapiens, which would have made him a powerful grappler. That doesn’t mean, however, that we would be an easy kill for our extinct relative. Homo sapiens probably has a longer reach, on average, than Neanderthals did, and more stamina. Most importantly, we could deploy these advantages to maximum effect using our superior wits. It’s obviously speculative, but a modern man of above-average build would have an excellent chance of defeating a Neanderthal in hand-to-hand combat if he could keep his opponent at arm’s length, survive the initial onslaught, and wear him down. The image of Neanderthal as a squat, chiseled brute is sometimes overstated. Based on the small number of known specimens, it appears that the males averaged 5 feet 5 inches tall, which is only 2 inches shorter than the average Chinese man today and 4 inches shorter than the average American man. Bone structures in many Neanderthal specimens suggest that their biceps were no larger than those of an average Homo sapiens, and some of the Neanderthals unearthed in the Middle East were as slender as modern humans. Neanderthals also had an intellectual side: They decorated their bodies with sparkly paint and sea shells, and some archaeologists think they even played a primitive flute. There was tremendous variation in the build and ferocity of Neanderthals, as there is among modern humans. The probable result of any interspecies scrap, therefore, would depend on the individual combatants involved. It would also depend on training. There’s no telling how a reanimated Neanderthal would attack or defend himself in a fight against a Homo sapiens. A trained modern fighter would know exactly where to strike the Neanderthal for maximum damage, giving him a tremendous advantage. On the other hand, the human brain can work against us in combat. Many animals continue to struggle long after they are shot, for example, while humans tend to collapse immediately under the psychological stress of being wounded. When it comes to fighting for our lives, we are sometimes too smart for our own good. Neanderthals are lightweights compared to some of our other evolutionary neighbors. You would not want to encounter Homo heidelbergensis on a deserted sidewalk. Some specimens were more than 7 feet tall with thick bones. They were also cannibalistic at times, which means they knew how to fight other archaic humans. Their brains were smaller than those of Neanderthal or Homo sapiens—that’s a tactical disadvantage, but they probably fought with an animalistic ferocity. Paranthropus boisei would also have been a terror in combat. Often described as a gorilla head on a human body, the creature had powerful jaws and enormous teeth, as well as well-developed back muscles. Explainer thanks paleoartist Viktor Deak, author of the forthcoming book The Human Fabric: A Compendium of Hominid Gross Anatomy.